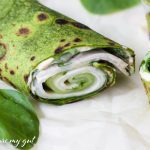 Gluten Free Spinach Turkey Cucumber Roll-Ups- a quick and easy recipe made with gluten free spinach tortillas, turkey, cucumber slices, cashew cream cheese and fresh spinach. 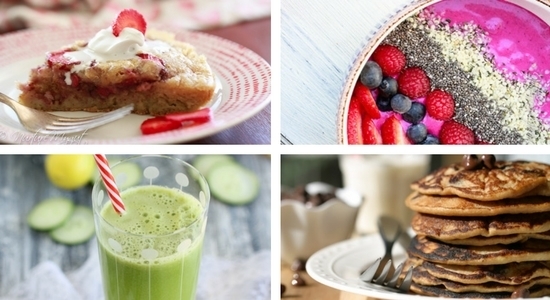 Perfect for a quick lunch or packing in kid’s lunch boxes. Place gluten free spinach tortilla on flat surface. Apply a thin layer of hummus or cashew cream cheese over tortilla, leave 1/2-1’’ at edge. Fold turkey in half and layer over spinach. Do not cover half of spinach. Place wrap on a paper towel and begin to roll at edge where cucumber is. Fold over and wrap tightly. You can cut in half and serve or cut into slices and place toothpicks to hold slices in place.